1. Put a pan over a medium heat and toast the almonds, tossing regularly, for 2-3 minutes until golden; set aside. 2. Steam or boil the broccoli for 3-4 minutes until just tender. Meanwhile, mix the lemon zest into the olive oil and season. 3. 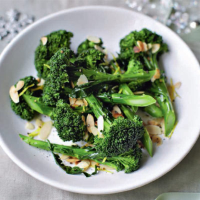 Toss the broccoli with the flavoured oil, scatter over the almonds and serve.